Where to begin? Today was a long, full, fun, packed agenda. 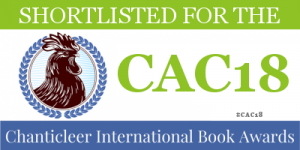 Beginning with breakfast, we went on into the presentations, lunch, more presentations, a little book sales, and finally to El Gato, Houston’s cat café. 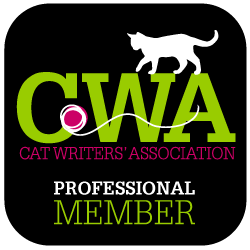 For any of you who are cat writer’s, bloggers, artists, poets, photographers, please look into joining the Cat Writers’ Association. What an amazing group of diverse creativity! Thankful to be here. Goodnight. 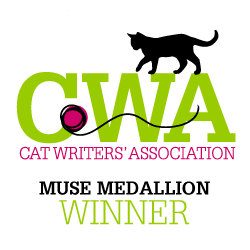 This entry was posted in Blogging, CAT WRITERS, Cats, Crazy Cat Lady Mysteries & More, Writing and tagged cat cafe, Cat Writer's Association conference, Houston, Los Gatos, Travel, writing. Bookmark the permalink. Very busy, but relaxed atmosphere and great people. The Cat Cafe looks an awesome place to spend a little time, and to help cats in the area too. It was great fun. The cafe even has a book club, and the writers donated some books.